The Corsair Professional Series GOLD AX850 modular power supply is 80 Plus Gold certified to deliver at least 90% efficiency at 50% load, cutting down your electricity bill and reducing heat generation. Flat, low-profile modular cables allow for easy cable routing and increased airflow. Ideal for performance enthusiasts for whom consistent delivery of rated power output is essential, the GOLD AX850 delivers 850W of stable, continuous rated power at ambient temperatures of up to 50° C. High quality Japanese capacitors provide uncompromised reliability and long lifespan. Hybrid Silent Fan Control regulates the ultra-quiet 120mm double ball bearing fan. Fully compatible with the ATX12V v2.31 and EPS12V 2.92 standards, the GOLD AX850 also builds in over-voltage, over-current, under-voltage and short circuit protections for maximum safety to your critical system components. ATX12V and EPS12V Compatible Supporting the latest ATX12V v2.31 and EPS12V v2.92 standards and backward compatible with ATX12V v2.2 and ATX12V v2.01 systems, the Corsair Professional Series GOLD AX850 provides maximum power stability to drive the processors as well as other components for desktop and server computer systems. 80 PLUS Gold Certified The 80 PLUS Gold certified power supply provides high power efficiency of at least 87% at any load between 20% and 100%, saving your money on your electrical bill, reducing heat in your computer's system and prolonging its life. 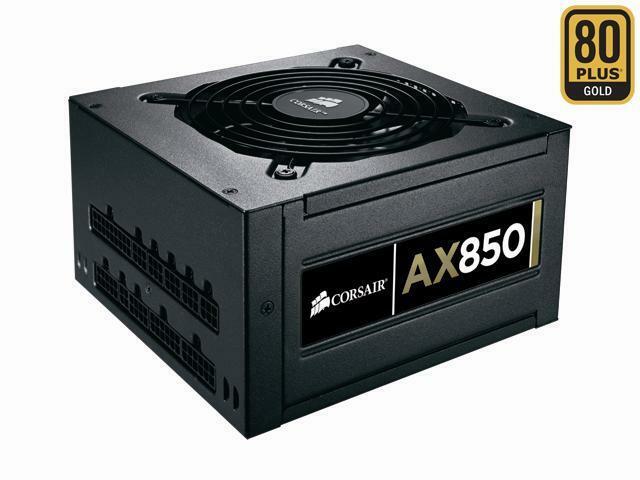 850W Continuous Power with Single Strong +12V Rail The Corsair Professional Series GOLD AX850 delivers 850W reliable, continuous output for high-end computer systems. A strong +12V single rail ensures the maximum provision of 12V power to energy-hungry components such as CPU and VGA card, minimizing the likelihood of overload shut down. Flat Modular Cable Design The fully modular cable design allows only use of the cables you need to improve internal airflow and reduce clutter. Additionally, low-profile, flat cable design reduces air friction and helps maximize airflow through your computer's chassis. Ultra-quiet 120mm Dual Ball-bearing Fan An ultra-quiet 120mm San Ace fan from Sanyo Denki delivers excellent airflow at an exceptionally low noise level by varying fan speed in response to temperature. SLI & CrossFire Ready With 4 x 6+2-pin PCI-E connectors, the Corsair Professional Series GOLD AX850 is ideal for building flexible SLI or CrossFireX gaming system. UL, CUL, CE, CB, FCC Class B, TUV, CCC, -tick. 5.9" x 3.4" x 6.3"
Universal AC input from 90~264V: No more hassle of flipping that tiny red switch to select the voltage input! Other Thoughts: If you got a bad one, I feel for you son, I got 99 problems but a PSU ain't one! If your gonna complain about the price, maybe you should just stop there, these power supplies are worth every penny! Cons: Worked great until the last couple of months I have been having problems where I would turn it off and then the next morning it would not power on. I have tried with known working ram, cpu, video card and motherboard. MB has its only power button so that I can power it on without a case so not power button on case. Just glad it has a 7 year warranty. Time to get another one and hopefully it works for longer. Other Thoughts: I would recommend because it worked great for 5 years and since it has a 7yr warranty I will get another one. The stand behind there products. We're sorry that your Corsair PSU failed. Please contact our Tech Support at 888-222-4346 or submit a ticket at corsair.force.com and we'll be more than happy to assist you with an RMA if necessary. Cons: So about 6 months ago my computer crashed and would not reboot. I tested everything and figured out it was the power supply. The next day I decided to try it again and the computer magically started up without issue. This has happened once every month or two. Computer crashes, won't boot or do anything, and then suddenly start working when i try it a few hours/day later. It happened again and I think it's toast now. Tried the paperclip test and nothing. Haven't taken a meter to it yet but at this point I'd rather just get a new one. This shouldn't happen. I bought this power supply with the hopes that I would be able to use it through several different systems. Hopefully their customer service is responsive otherwise I won't be buying their products anymore. Pros: Never had any problems until a few months ago. This was powering overclocked i7 2600k and 2 GTX 580's, 2 SSDs, dual monitor (one 120hz, one 60hz 1080p). Cons: The power supply would provide power but eventually lead to power instability. Part of the reason for such a late review. 4-5 years later, my new motherboard would not power on/POST because of the unstable power. I replaced the PSU to verify this issue. Low and behold, the new power supply eliminated the issue I was experiencing. Other Thoughts: This goes without saying. Power supplies die over time. It took this one 4, almost 5 years to not be usable anymore. Luckily, the 7 year warranty was a major help. Since this power supply is now discontinued, I got a replacement 860, whopping 10 watt difference. I should stress that this is my first formal review of a product that I've had intimate experience with. Reviews on products that have been out for less than a month don't have enough time for bugs and issues, like I've had, to manifest themselves. Call me old school, but tried and true products that have had time to mature or the products to by. That being said, I'm incredibly hypocritical and have bought many products that have been just introduced to the consumer market. This power supply was great, which is why it got 4 stars and not one. But the hassle of not knowing that it was my power supply that was giving me the power issues since the computer was working perfectly fine until it stopped powering on was irritating. I would definitely by Corsair again, the warranty is just incredible. Pros: Did its job. Recent power outage caused some problem. PC boots, but case fans will not. Checking with Corsair support to figure out if it's the PSU or the case. Owned for over 2 years. Cons: Cables are a bear to deal with. Not very maneuverable. Pros: I have been running mine since early 2011. The power supply has not had a hiccup yet. So it appears that the lifetime is highly variable. Pros: Reliable and worked great for 2 years! Cons: PSU died! After 2 years of use system would only power up intermittently. Thought it was a mobo issue even though it was 2 years old as well. Took it to a computer store where the technician found it to be the PSU. Normal life expectancy should be around 3-5 years from what I've read depending on the usage. Pros: - Has all the power and connectors I need for my server motherboard and backplane with 24x 3.5" drives. - Running for almost a year constantly in a datacenter with no issues.